Participants at the Flip The Script workshop in San Francisco paint “selfies.” “There's a lot of psychological baggage behind us and this is a space for [participants] to unpack,” says coordinator Maria Hu Wu. In the center of San Francisco’s Chinatown, about half a dozen young people are gathered in a meeting room, hunched over large pieces of poster paper. They’re working on “selfie” portraits, sketching and painting images of themselves with watercolor or acrylic paint. During one evening in September, the event’s coordinator, Maria Hu Wu, encouraged participants to start reflecting on the next art project on the list; depicting what home means to them on small wooden squares. The workshop is called Flip The Script. It’s a monthly event that runs from July through November. A final workshop in December will serve as a pop-up art gallery event featuring the art participants created. And they are planning another set of workshops for next year. Julio Salgado is a Bay Area artist who led the Flip The Script workshop by ASPIRE. The program was developed by ASPIRE, a pan-Asian immigrant advocacy group based in San Francisco. Organizers say they hope creating art can inspire and encourage young people — especially those in the Asian and Pacific Islander community who are undocumented — to share their stories and to talk about their immigration experience. Wu says being vocal helps young undocumented Asian and Pacific Islanders identify with each other, build a support system and share resources. ASPIRE leaders say the concept for Flip The Script came about last summer when immigration was just starting to become the focus of the presidential election. Republican nominee Donald Trump, through much of his campaign, has focused on building a wall on America’s southern border as part of his immigration platform. He says it would stem the flow of undocumented immigrants. But many advocates say the focus on the southern border, does not reflect the fact that the fastest growing segment of unauthorized immigrants is people coming from Asian countries. 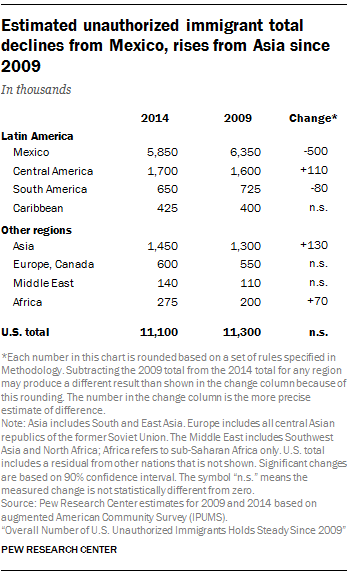 According to Pew Research, the number of unauthorized immigrants from Mexico in the US has declined from 6.9 million in 2007 to 5.8 million in 2014. Meanwhile, an estimated 1.45 million of the nation’s 11 million undocumented immigrants are people from Asian countries, up from 1.3 million in 2009. People from Asia make up about 13 percent of the overall undocumented population. In fiscal year 2015, according to government reports, nearly 150,000 people were deported to Mexico but only about 700 people who were deported to China and India — the two largest sources of unauthorized immigration from Asian countries, according to the Migration Policy Institute. In addition to rhetoric around immigration, Megan Essaheb, also with Asian Americans Advancing Justice, says the conversation around refugees should be equally troubling for Asian Americans. Trump, for example, has called for “extreme vetting” for people coming as refugees from Syria. She points out that many of those who came from Vietnam and other Southeast Asian countries came to the US as refugees. “We’ve been trying to engage those discussions and make sure prejudice doesn't play in our decision on who we welcome in America,” says Essaheb. Many advocates say the model minority myth persists among Asian groups and prevents individuals from being open about their immigration status. Wu points to recent events, specifically the 2015 fatal shooting of 32-year-old Kate Steinle on San Francisco’s Pier 14, which galvanized anti-immigration proponents. An undocumented immigrant is being charged with second-degree murder in the case. Wu says the backlash against undocumented immigrants after the incident and the uncertainty around the presidential elections are reasons why many in the AAPI community are reluctant to talk about their immigration status. ASPIRE coordinator Maria Hu Wu paints a “selfie" (right) and a portrait of her mother (left). She came to the US as a child with her sister, but they were separated from their mother who could not come into the country. Being undocumented herself, Wu says she understands the fear. She only started speaking publicly about her status last year. She says she is still nervous about retelling her story of how she came to the US. Wu actually didn’t migrate from Asia. She was born in Sonora, Mexico, to Chinese parents. When she was 17, Wu came to the US with her sister. She thought she would only be here temporarily — she came on a tourist visa — but ended up staying in the country. It wasn’t until later that she discovered she did not have authorization to be in the US long-term. Wu says she feels compelled to share her story so she can help others find a community.